The Orbitel TPU 900 (left) was the world's first GSM phone. As you can see it was hardly tiny. Digital technology was more bulky than analogue. This world's first went to a British company, Orbitel, a joint venture between Racal and Plessey, beating Nokia, Motorola and Ericsson to make the first phone to be approved for the new GSM standard in 1991. 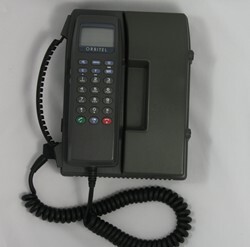 As you can imagine these phones were not great sellers, however, Orbitel succeeded in exporting them to Germany and there was a revised model, the TPU 901. The Orbitel was the first phone that the UK's first GSM provider, Vodaphone, offered. This phone also has the accolade of being the first phone to receive a text message. Neil Papworth, sent the world's first text "Merry Christmas" on 3 December 1992 to Vodafone director Richard Jarvis, who received it on an Orbitel TPU 901. As GSM spread to Africa, these phones became something of a status symbol, because of their large size. "Orbitel started as a Plessey / Racal joint venture. Racal became Racal Telecom and bought out Plesseys share. Ericsson closed the basestation part of the company. Kept the mobile phone part. "This was a really important phone. The first on the market, but also important for having a test interface. If you had the right cable and a connected laptop it would tell you in great detail what was happening to it on the network. This made it indispensable for engineers charged with network rollout, launch and optimisation. I hav an old "Orbitel MTU/TPU 900", the Siemens Clone, and I'd like to ask if you have the Pinout for the Charger and Power Port.